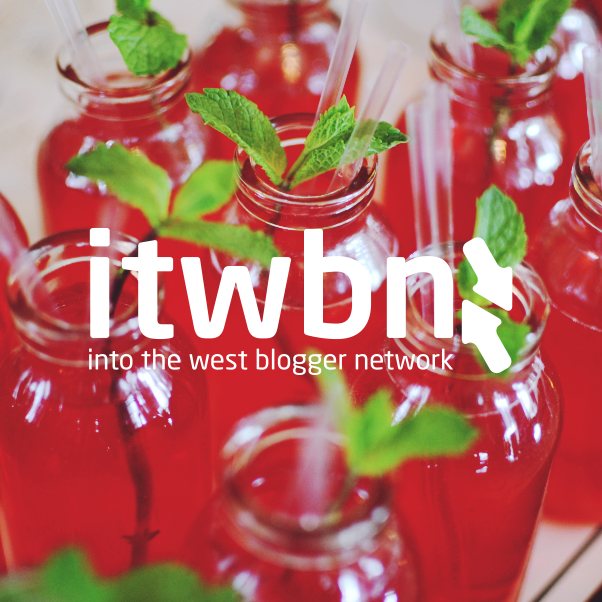 I was so excited about doing this post as it was about my first ITWBN meet up AND it was also the 1st birthday of ITWBN !! It was such an amazing day and it met all my expectations and more!! So ITWBN stands for In To The West Blogger Network. It was co founded by Saibh Egan and Siobhan Carroll. The work these ladies put in to the events, blogger meet ups, etc. is just outstanding. They are two incredible ladies and should be so proud of all their work they put in to the blogger event as it was exceptional. So myself and Bébhinn from A Judgeless Life headed to the event together, from the moment she got in to the car it was just a barrel of laughs!! Myself and Bébhinn met through blogging and I am proud to say she is one of my best friends now! She is a super girl and a joy to be around :) We had so much fun from the beginning to the end. So we arrived at the hotel we were staying in for the night which was Flannery's hotel just a 5 minute drive from the G hotel where the event was being held. So it was lashing rain and we had to fix ourselves before heading to the G! So as we finally touched up our make up and I totally just redid my hair (which completely let me down) we headed off to the G hotel, there was silence in the taxi as we anticipated what the event was going to be like! Well that and Bev was playing around with batteries for her camera! We like to leave things last minute haha! So we arrived! And OH MY GOD the nerves turned to excitement as we saw the long queue forming to enter the room where the magic happens :D before we went to register we bumped in to Meggan VanderMeulan from Cardigan Jezebel, She is super cool and myself and Bev were amazed by her purple hair!! 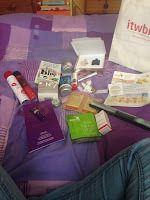 She is awesome and I absolutely love her blog and quirky style :) Next Bev then saw Amy Loonam from Batwings and Lashes ! I am a huge fan of this girls blog! Amy is so quirky and unique! Her style is amazing!!!! and she had the coolest nails haha!! The girls were just so lovely and was like we were always friends the chat wasn't awkward or uneasy! everyone just got along ! it was brilliant. So we made our way in and joined the long queue and excitement built within us! the ladies at the door were fantasic and so welcoming! so we made our way through the doors to be greeted by loads of bloggers chatting and stalls full of brands including No7, Debenhams, Envy Organica and many more. The atmosphere was electric in the room. We were welcomed by the hotel staff with a cocktail, which didn't last long :P We made our way to our table, myself and Bev were on the same table which we were so happy about, I needed my partner in crime beside me! so we were greeted with a goodie bag on our chair with our name tags, a lovely little pretty pink box and a beautiful little stand of treats and desserts on the table. In the pretty pink box there was a gorgeous little cupcake and a chocolate treat baked by the very talented baker on site at the G Hotel!!! They didn't last any length with me! I inhaled them haha! delicious!! The Display tables of all the brands were just amazing! So when we were all seated The manager of the G Hotel done a little welcome speech. She was absolutely lovely and made us feel so welcome. Saibh and Siobhan said a few words and thanked us all for coming, they then welcomed Sinead Burke from Minnie Mélange. She was exceptional!! such an inspiring young woman who taught me that no matter what you put your mind to you can achieve it! I loved how humble she was and how sensible she was. Not only is Sinead an exceptional blogger she is also studying a PHD and hopes to be a lecturer in Primary school teaching. How amazing is she!!! She taught me that what you put out there on the internet will stay with you always so be careful what you choose to do and also think ahead, do not do something just for the sake of it but something that will stand to you for your future self. So after the intermission we were then greeted by Wayne Denner who gave an amazing speech on the safety of the internet. Again he really made me think twice about what I post on Facebook or Twitter, even though you may delete something from it its still out there. It's vital that you ensure your own safety on social media and be careful what you post as it can and will be held against you. I enjoyed his speech as he also added some humour to it too so he was easy to listen to and very informative at the same time. So the day came to an end. Myself and Bev couldn't believe how quick it had gone by!! We were a little sad when it was all over haha! we had such a good time we wanted to last so much longer!! So we were gonna stay on a little while longer but funds were not in our favour so we made our way back to the hotel we were staying at, we then headed off to McDonald's for some grub before going to Tesco to get some drinks and nibbles for the night!!!! oh yesss we are so classy haha :) Oh and Bev was freaking out because we had no bottle opener so we picked one up in Tesco for €2 ! score haha!! we had so much fun and laughed myself in to a coma!!! The next day we got up, beautified ourselves and checked out. We decided to make the most of the day and headed to Salt hill where we nearly got blown away by the wind!!!! If we had hangovers they were well and truly blown away after that walk!! The sea air was amazing and so refreshing! I absolutely love Salthill, such a beautiful place! !